This is the complete guide to Coal Harbour, Vancouver, BC, Canada. Coal Harbour is a bay off of Burrard Inlet in downtown Vancouver. It is named Coal Harbour because it does contain coal. It once stretched almost all the way to Second Beach in Stanley Park and contained Lost Lagoon, but has been cut off by the Stanley Park Causeway. 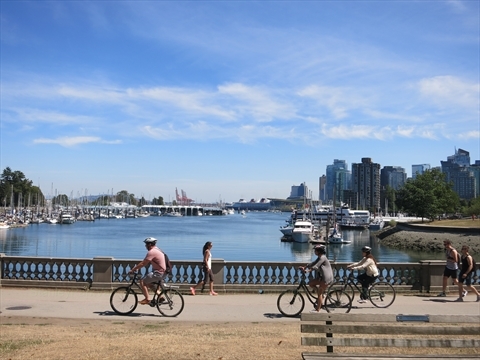 Over the last 20 years, it has been developed into one of the priciest and vibrant neighbourhoods of Vancouver with thousands of condos, it's own seawall, parks, attractions, monuments, statues, and restaurants! 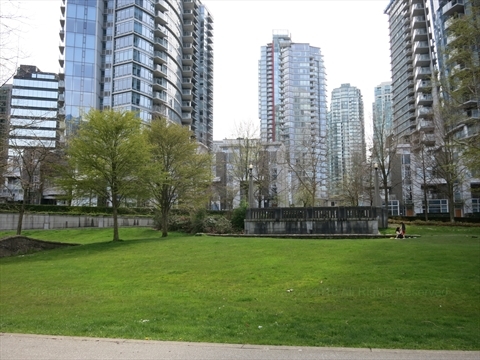 This page will describe the things on the south side of Coal Harbour. The north side of Coal Harbour (Vancouver Rowing Club, Royal Vancouver Yacht Club, Deadman's Island, Hallelujah Point, Nine O'Clock Gun, etc.) are discussed in the Stanley Park part of this web site. The Coal Harbour Seawall is a seaside walkway that runs from Stanley Park to the Vancouver Trade and Convention Centre. Along the way, there a number of restaurants, marinas, hotels, parks, monuments, and art works! 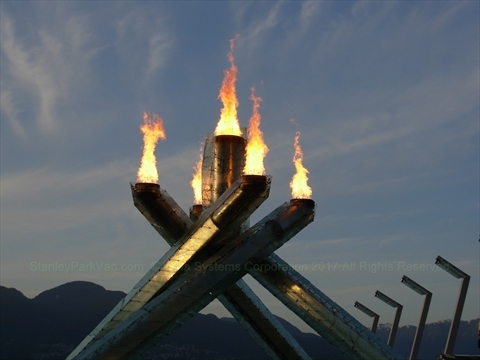 The 2010 Olympic Cauldron is from when Vancouver hosted the Winter Olympic Games in 2010. 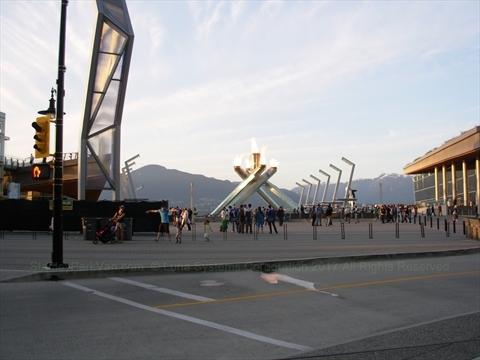 The Jack Poole Plaza is a plaza outside the Vancouver Trade and Convention Centre where the 2010 Olympic Flame resides. 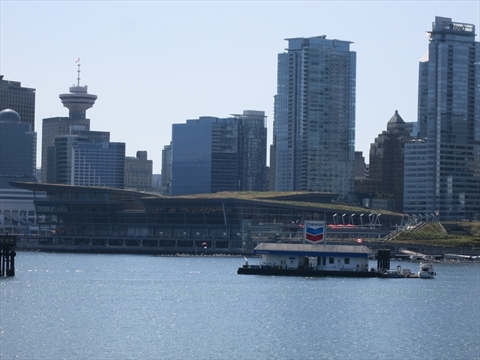 The Vancouver Trade and Convention Centre underwent a huge expansion for the 2010 Winter Olympics and now can host some of the largest conventions in the world. Also, it is home to the TED talks! 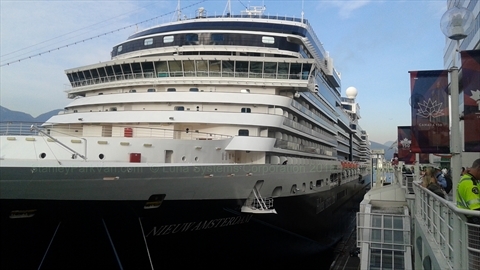 The Vancouver Cruise Ship Terminal is located at Canada Place in Coal Harbour. 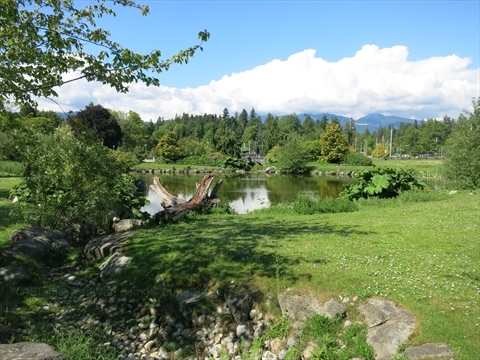 Devonian Harbour Park is a serene park right near the entrance to Stanley Park. Originally, it was cleared and lived on by families from Hawaii! 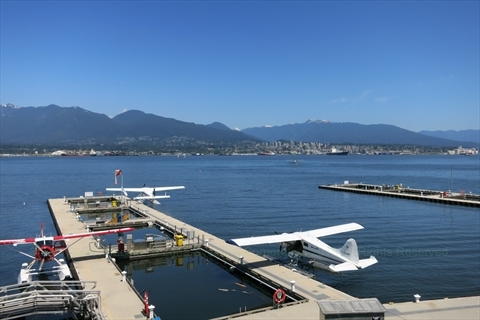 The Coal Harbour Seaplane Terminal is an airport that is located on the water at the end of the new Vancouver Trade and Convention Centre. 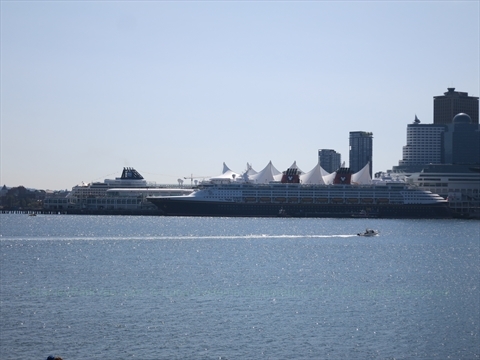 Canada Place is the original Vancouver Trade and Convention Centre and Cruise Ship terminal. It has been a Vancouver landmark since it opened as part of Expo 86 with it's 5 distinctive sails and it's design to look like a ship. It is also home to Fly Over Canada, Port of Vancouver Discovery Centre, and the Discovery Trail. At night, the 5 sails may be lit up in different colours. 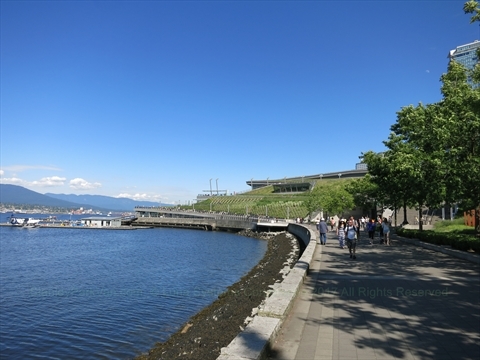 The Port of Vancouver Discovery Centre is a place where you can go to learn about the Port of Vancouver including it's history. It has displays and has free admission. 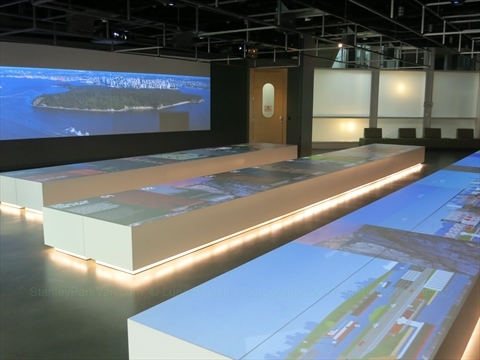 Fly Over Canada is one of Vancouver's newest paid attractions. 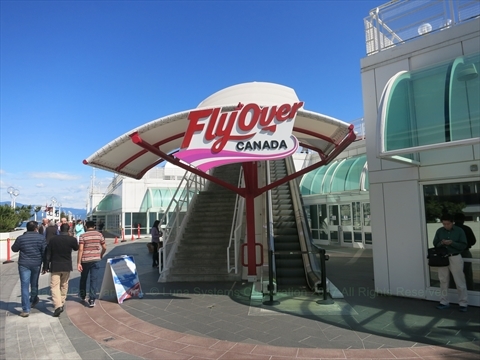 It is located near the water's end of Canada Place and takes users on a flight over Canada that you don't want to miss! 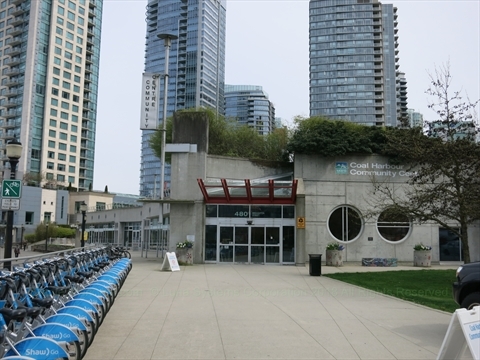 The Coal Harbour Community Centre is primarily for the residents of the Coal Harbour neighbourhood. It has rooms that are used for community workshops, events, gathering, and also has fitness activities. 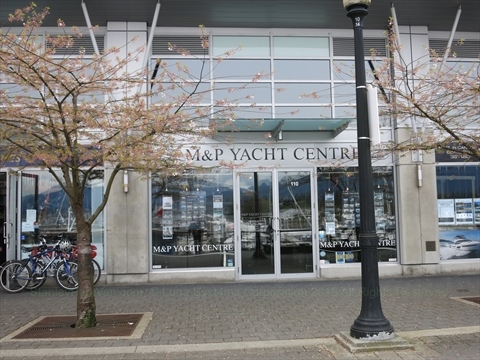 The Coal Harbour Marina is a large marina located right in front on the Coal Harbour Community Centre. 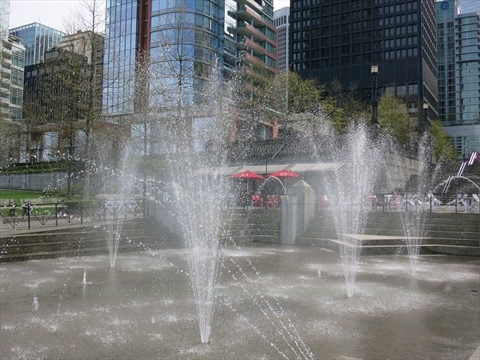 Harbour Green Park is the main park in Coal Harbour. It consists of two large grass sections separated by the Tapshack restaurant and Children's Water park. The Nike statue was a present to Vancouver from the City of Ancient Olympia in Greece for hosting the 2010 Olympic and Paralympic Winter Games! 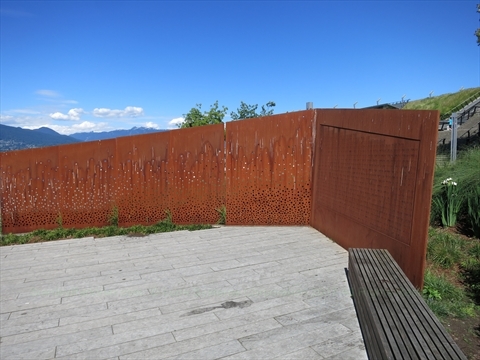 The Komagata Maru Monument is a monument to a sad time in Vancouver history, 1914, when the steamship Komagata Maru arrived in Vancouver carrying indians from India. They were denied entry to Canada and were sent back to India. 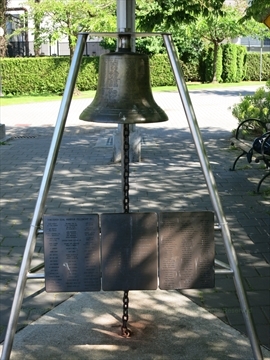 The Coal Harbour Fellowship Bell is a bell and plaques that have a lot of names on them! Not sure what is it commemorating! If you know, please contact us! 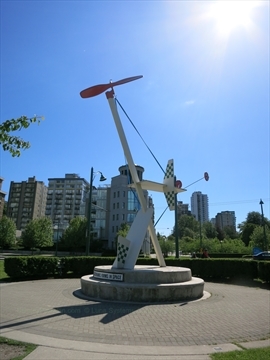 The Aerodynamic Forms in Space Artwork is a piece of art near the entrance to Stanley Park in Devonian Park. Artist: Douglas Coupland, British Columbia. 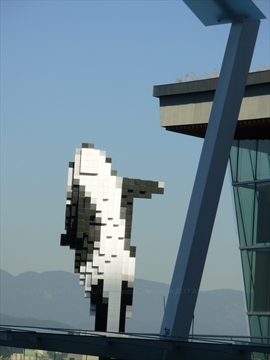 The digital orca artwork is a piece of art in the Jack Poole plaza of the Vancouver Trade and Convention centre that looks like a breaching orca (killer) whale! 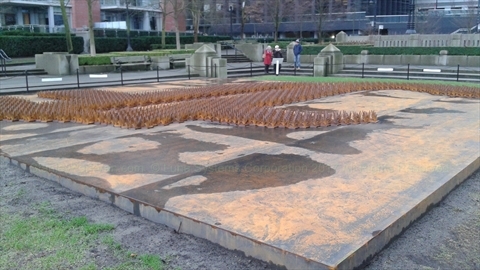 The F Grass artwork is a recent artwork by the famous chinese artist Ai Weiwei that has appeared in Coal Harbour. 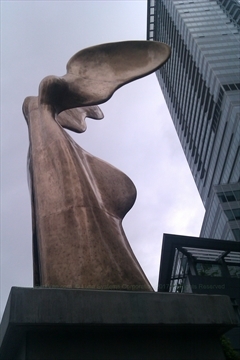 The artwork, Meeting, was a temporary piece of art in Coal Harbour by artist Wang Shugan. 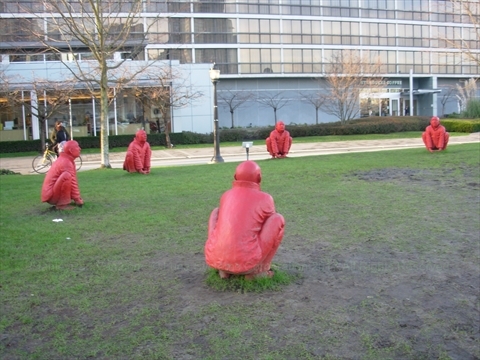 It is no longer there, but was interesting because it was a bunch of red men squatting in a circle. Artist: Inges Idee, Germany. Located outside the new Vancouver Convention Centre at the North East corner of the outside walkway. Artist: Germaine Koh, British Columbia. 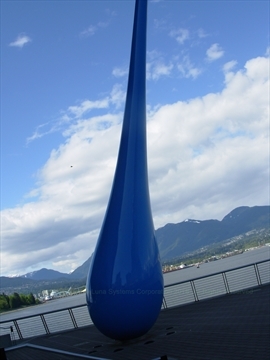 Located outside the new Vancouver Convention Centre at ???. Artist: Jaakko Pernu, Finland. Located hanging from the ceilings in the lobby of the new Vancouver Convention Centre. Artist: Derek Root, British Columbia. Located in the floor of the new Vancouver Convention Centre in ?? ?what area???. Artist: Joseph Wilson, British Columbia. Located in the new Vancouver Convention Centre in ?? ?what area???. Artist: Jill Anholt, British Columbia. Located just outside the new Vancouver Convention Centre on the west side on the living roof where the living roof angles down to the walkway. Artist: Roy Arden, British Columbia. Located inside the new Vancouver Convention Centre in ?? ?what area???. Artist: Susan Point, British Columbia. Located inside the new Vancouver Convention Centre in ?? ?what area???. 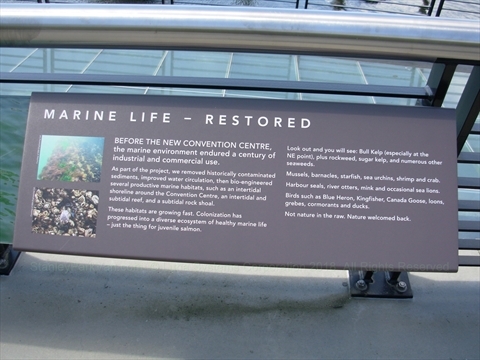 Located at various points around the new Vancouver Convention Centre are a number of interpretive panels describing historical Vancouver events and things. Art works of various artists are shown in the Coast Salish Gallery in the new Vancouver Trade and Convention Centre. Art works of various artists are shown in the BC Artists Gallery in the new Vancouver Trade and Convention Centre. There are a number of bars, pubs, restaurants, and cafes at Coal Harbour where you can have breakfast, lunch, brunch, and dinner or just a coffee or a beer! There is a restaurant for all your dining experiences. These are all restaurants that are near the Vancouver Trade and Convention Centre. 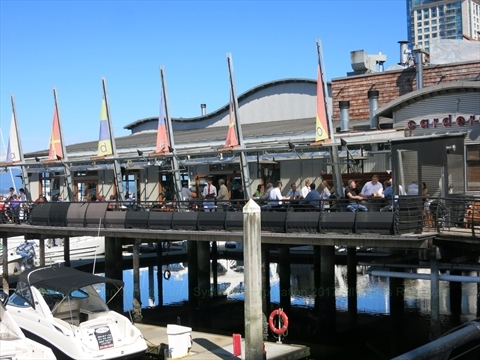 This is primarily a seafood restaurant that is located literally on the water (actually on pilings) in Coal Harbour! It is an upscale seafood dining experience. It also has a large covered outdoor patio. 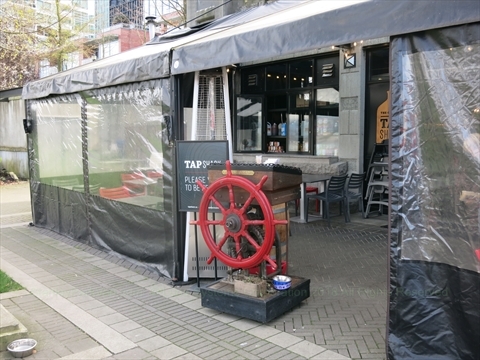 This restaurant is located right on the Coal Harbour Seawall in Harbour Green Park. It is just down the stairs from the corner of Bute and Cordova streets. This is a small restaurant that has a large outdoor patio. 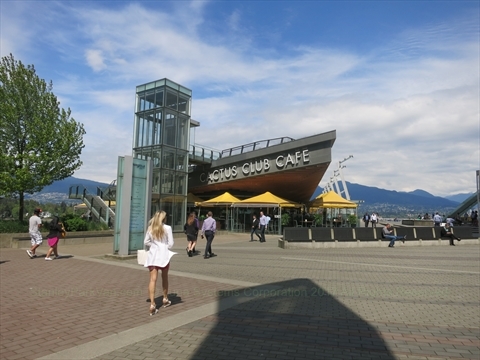 This is a great place to go in the summer to sit outside with a great view of Coal Harbour and the northshore mountains! 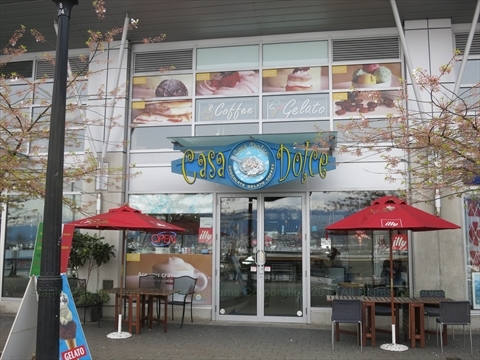 This is a small cafe on the Coal Harbour Seawall. 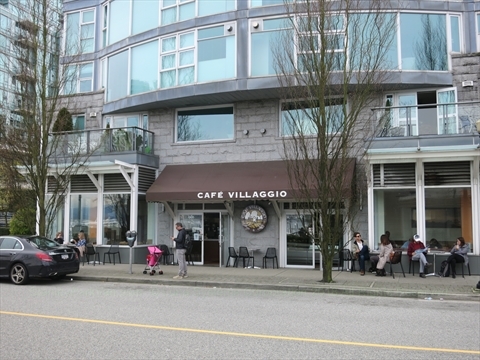 This is a small coffee and gelato cafe on the Coal Harbour Seawall. 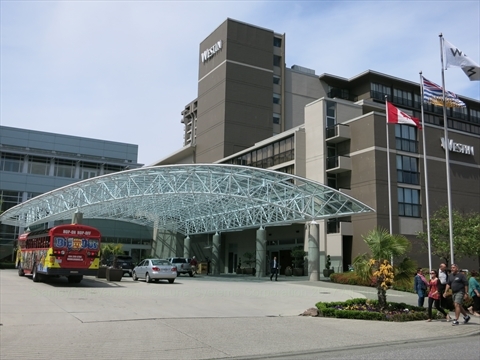 The Westin Bayshore Hotel is a luxury hotel right on Coal Harbour and very close to Stanley Park. This is a fitness club located in the Vancouver Trade and Convention Centre-West. This fitness club is owned by Trevor Linden, the legendary NHL Hockey player who was a long-time captain of the Vancouver Canucks and is currently the hockey club's President. Coal Harbour Business Association gyms, spas, etc. Captain Henry Richards on HMS Plumber found coal here in 1859 and named it Coal Harbour. Unfortunately, there wasn't enough coal to make it economical to mine. There is a parking lot at the Coal Harbour Community Centre. 2018 prices are: $3 per 1/2 hour 6am-7pm, or $16/day 6am-7pm, or $7.50 evening flat fee 7pm-6am. 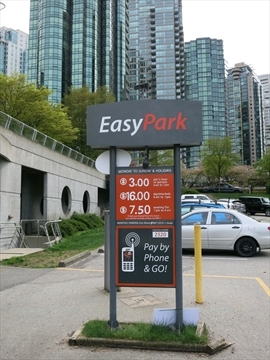 Most of the Coal Harbour neighbourhood has residential only parking whereby residents need to purchase a parking permit. 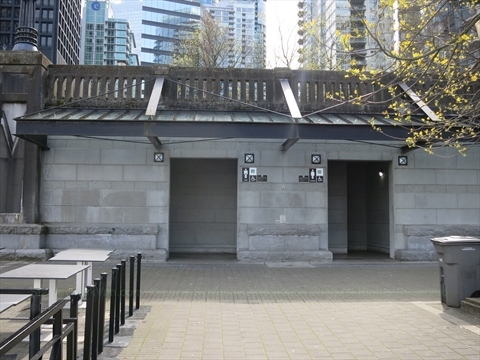 There are public washrooms at Harbour Green Park next to the Children's Water Park and Tap Shack restaurant. 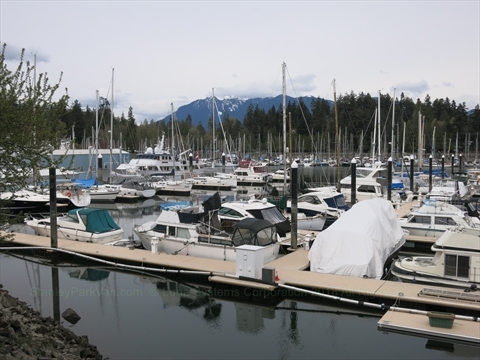 Coal Harbour is an inlet of water in Burrard Inlet in Vancouver, BC, Canada. Coal Harbour borders Stanley Park, the Coal Harbour residential neighbourhood, and downtown Vancouver.